The attacker is facing close to a month in the treatment room. DESPITE FACING A couple of weeks on the sidelines, Shane Long is in good spirits. He was forced off with suffered suspected rib damage during Southampton’s FA Cup defeat to Crystal Palace yesterday having only entered the game as a substitute twelve minutes earlier. Speaking afterwards, Saints manger Ronald Koeman indicated the attacker will be out for close to a month. Initially, there had been some serious concerns for the Republic of Ireland striker when footage emerged of him being taken to hospital in an ambulance. But, earlier today Long took to Twitter to show he’s already on the road back to fitness. Since his summer move to St. Mary’s, the former West Brom and Hull man, has scored four times – twice in the league. But, in recent weeks, he has been used more as an impact substitute by Koeman. It’s another injury blow for the club though. They’re already without Morgan Schneiderlin, Victor Wanyama and Toby Alderweireld while Jay Rodriguez remains in the treatment room after damaging his ACL at the end of last season. 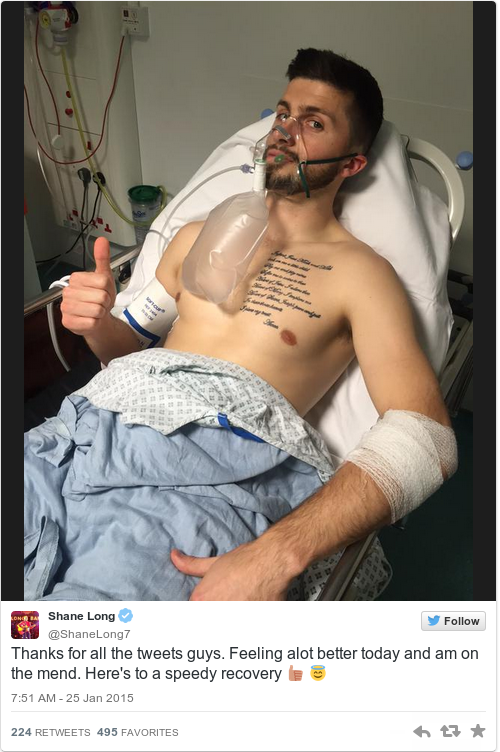 Email “Shane Long is on the mend after suffering rib injury during FA Cup clash ”. Feedback on “Shane Long is on the mend after suffering rib injury during FA Cup clash ”.